Stonehenge - a House of the Holy? ABSTRACT: Stonehenge in central southern England is internationally known. Recent re-evaluations of its date and construction sequence provides an opportunity to review the meaning and purpose of key structural components. Here it is argued that the central stone structures did not have a single purpose but rather embody a series of symbolic representations. During the early third millennium this included a square-in-circle motif representing a sacred house or ‘big house’ edged by the five Sarsen Trilithons. During the late third millennium BC, as house styles changed, some of the stones were re-arranged to form a central oval setting that perpetuated the idea of a sacred dwelling. The Sarsen Circle may have embodied a time-reckoning system based on the lunar month. From about 2500 BC, more than 80 bluestones were brought to the site from sources in the Preseli Hills of west Wales about 220km distant. Initially arranged as a Double Circle they were variously rearranged at least four times over the following centuries. The diverse lithology of the bluestones reflects the landscape from which the stones derived so that the monument embodied a microcosm of the distant land. Associations with water and healing suggest one reason why Stonehenge became such a powerful place in prehistoric times. The paper is interesting and provoking and an excellent addition to the canon of Stonehenge research. It is wide ranging and discusses many different ideas and sets them within the historical context. It is probably just because I have spent many hours studying the exact layout of the sarsens that I am uneasy with one of the central themes of the paper. The central theme that concerns me is that the sarsens represent a ‘square-in-circle’ structure, To quote: "specific similarities between the Sarsen Trilithon Horseshoe and the form of late Neolithic houses....the central square-shaped elements, the hearth and living floor, are usually set within a circular or near circular outer frame forming an integral part of the structure in which the difference in shape is absorbed by the thickness of the wall itself. Looked at as a kind of house, the Great Trilithon at Stonehenge could be seen as the equivalent of a dresser with a clear bipartite left and right division." This identification of the houseyness of Stonehenge then underpins his thesis of it being a house of the Holy. 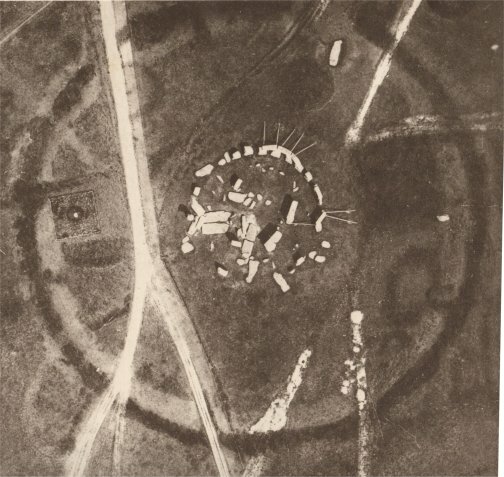 There are many examples of neolithic ‘square-in-circle’ structures given and the accompanying plan of Stonehenge supports the comparison. 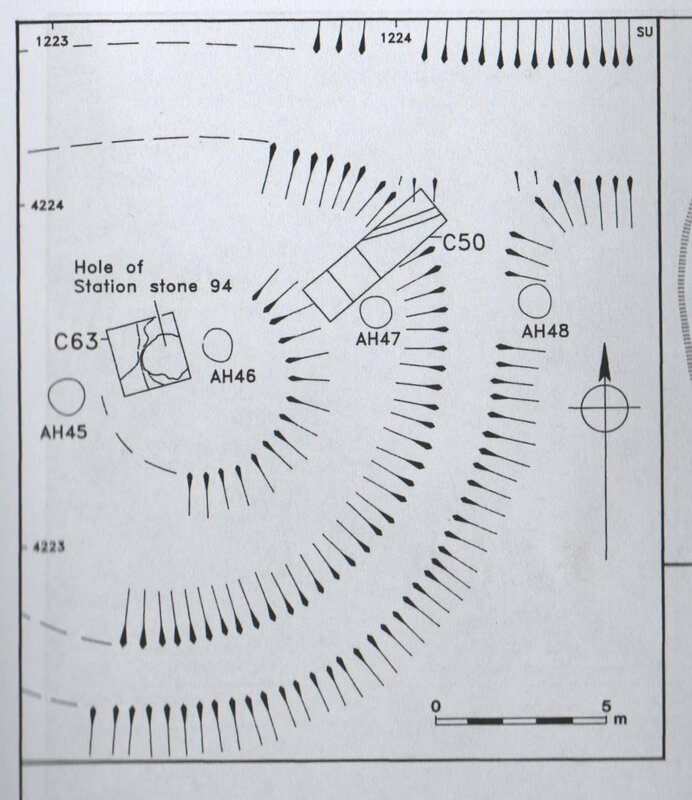 The position of the stones at Stonehenge has been measured and recorded many times and so it is understandable that the source for Darvill's plan of the central Sarsen arrangement is just given as "various". But to my mind the plan doesn't compare well with many of the other published plans of Stonehenge. Darvill plan left, English Heritage plan right, click to enlarge. His plan makes the ‘square-in-circle’ more obvious than other plans do, but I worry if it is accurate. Andy White Anthropology blog has a series of posts on moving megaliths in Indonesia - very interesting and instructive. The building of Stonehenge has been a topic of discussion for centuries but today all our questions may be answered. A group of volunteers in London is conducting a mass experiment to find out how the ancient monument came to be. 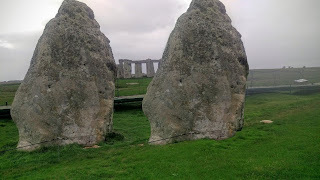 Just how did prehistoric Britons manage to transport the huge bluestones of Stonehenge some 140 miles from the Presili Mountains in Wales to their final home on Salisbury Plain, Wiltshire. ...But the project was a far scaled down version of the real thing, with the hefty slab weighing just half as much as the lightest blue stone used in the construction of Stonehenge. With ropes laced through holes in the concrete coffin-shaped slab, a video shows approximately 20 volunteers heaving at a call. 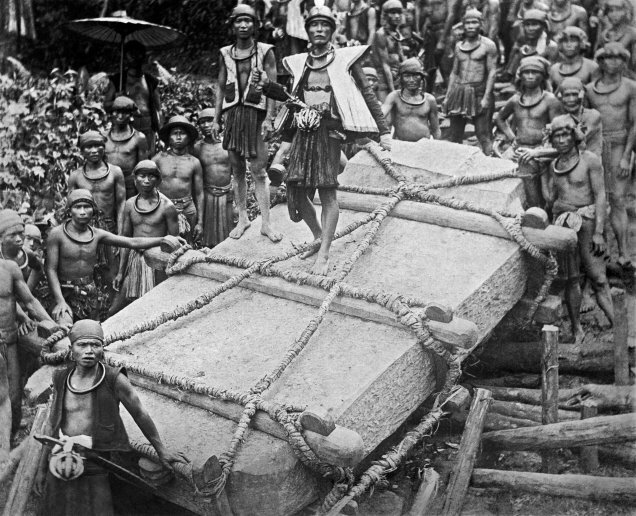 Their manual efforts pay off as the slab rolls across the logs, demonstrating how the Neolithic construction force behind the real monument would have shifted the stones thousands of years ago. Stonehenge in central southern England is internationally known. Recent re-evaluations of its date and construction sequence provides an opportunity to review the meaning and purpose of key structural components. Here it is argued that the central stone structures did not have a single purpose but rather embody a series of symbolic representations. During the early third millennium this included a square-in-circle motif representing a sacred house or ‘big house’ edged by the five Sarsen Trilithons. During the late third millennium BC, as house styles changed, some of the stones were re-arranged to form a central oval setting that perpetuated the idea of a sacred dwelling. The Sarsen Circle may have embodied a time-reckoning system based on the lunar month. From about 2500 BC, more than 80 bluestones were brought to the site from sources in the Preseli Hills of west Wales about 220km distant. Initially arranged as a Double Circle they were variously rearranged at least four times over the following centuries. The diverse lithology of the bluestones reflects the landscape from which the stones derived so that the monument embodied a microcosm of the distant land. Associations with water and healing suggest one reason why Stonehenge became such a powerful place in prehistoric times. Article is available for £28 or through the usual academic channels. Very kindly Austin Kinsley has sent me one of Pete Glastonbury's wonderful Stonehenge shots which shows the New Visitor Centre and Coach park from the western end of the Cursus; the proposed new Coach Station building is near the two white coaches that show up in the middle of the picture. 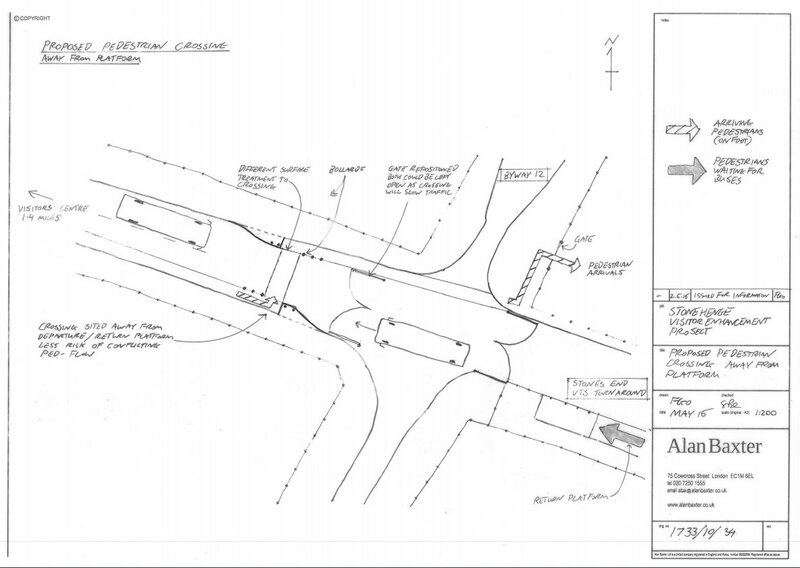 It was noted that the permissive path agreed as part of a legal agreement when the A344 was originally closed, was further down the site and did not form part of this application.....Although the location of the pathway connected to the A344 promise was outside of the application area, it was felt that Officers should work to achieve it. The application is unsurprisingly recommended for approval but I'm pleased to see my major objection has succeeded. 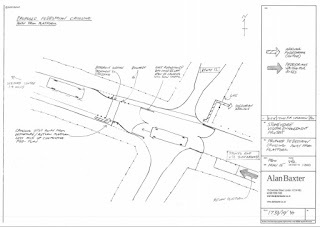 The Officer's recommendation:"Notwithstanding the submitted drawings showing the proposals for directing pedestrian arrivals in the vicinity of the A344 junction with Byway 12, prior to the commencement of the development hereby approved further details shall be submitted to and approved in writing by the Local Planning Authority demonstrating how pedestrians using the signed and lined route on the southern side of the A344 can access the Stones without having to cross the A344 or to walk within the route used by the Visitor Transit System to the east side of Byway 12. The approved details shall be implemented before the proposed bus turning arrangements are brought into effect." Some aspects of the original planning permission for the Visitor Centre are still not completed/conditions not complied with, e.g. the Right of Way from the Stock Bottom (A303) to the Stones, along the path of the old A344 is still not open for use, and there is no landscaped walk to the Stones from the Visitor Centre – [There is an ongoing enforcement case regarding some issues from the previous consent, however this is not of relevance to the current proposal]. I have been carefully looking through various planning documents about the New Visitor Centre near Stonehenge and the hub at Stonehenge, this is in response to English Heritage applying to alter the coach and visitor transit facilities which badly need improving. I look forward to the day when a safe and efficient system is put in place and I would not wish to impede this, but at the same time this is an incredibly valuable and important landscape and to accept the second best for short term expediency shames us all. It is with regret, but a sense of having to do the right thing, that I have lodged two objections to the new planning application 16/03988/FUL for these changes which include the building of a new coach station in the present temporary coach park. In the previous application S/2009/1527 , which this application is attempting to rectify some of the inadequacies of, the Environmental Statement 11110202R_ESVol 3_App 6.1_MH_24-09-09 notes that the Coach Park, and to a lesser extent the New Visitor Centre, will have a substantial/adverse impact on the view from VP09 the western end of the Cursus (the impact was predicted to decrease over fifteen years as landscaping shielded it). From the Lesser Cursus VP10 it would also have a similar effect. It is worth noting that the planted landscaping was removed when the temporary coach park was installed and so the decrease in impact has yet to start. The new building in the Coach Park will be very prominent from these two viewpoints and yet the Landscape and Visual Impact Assessment, 11110205_Photosheets_08-04-16.indd, makes no mention of these views from these very important monuments within the World Heritage Site and the substantial adverse effect it will have. This omission is so egregious that the application presents a false impression of the Landscape and Visual Impact and should be thus rejected until such time as a proper and thorough Landscape and Visual Impact survey is conducted taking into account the already established key views. 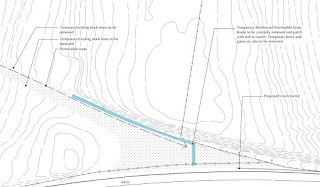 In the previous application S/2009/1527 , which this application is attempting to rectify some of the inadequacies of, the encouragement of non-vehicular access to the facilities was rightly a major factor. A key component was the encouragement of walkers and cyclists from Amesbury, and its links to national public transport. 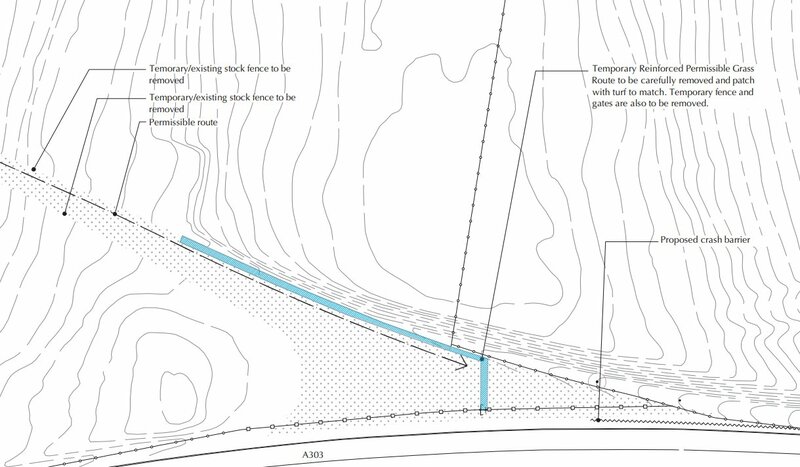 This new application shows the blocking up of the gate and path at the western end of this route and no mention of how the promised permissive path will be implemented. As well as encouraging more sustainable travel to the centre it is important for experiencing the holistic history of the site that this path follows the ancient road. This omission is so serious the application should be rejected until such time as plans to show this permissive path following the route of the old A344 are included and how its users are to be allowed passage. I hope these objections encourage English Heritage to look again at their plans and produce something better. Trying to produce a focused and specific objection I concentrated on the lack of a Landscape and Visual Impact Assessment of the building. There are two Landscape and Visual Impact Assessment survey documents produced, neither of them as far as I can see discuss the impact of this new building after it has been built. http://unidoc.wiltshire.gov.uk/UniDoc/Document/File/MTYvMDM5ODgvRlVMLDcyMTYyOA== does discuss the impact of the revised coach park from the Cursuses and concludes it will be mildly beneficial. Very kindly Austin Kinsley has sent me one of Pete Glastonbury's wonderful Stonehenge shots which shows the New Visitor Centre and Coach Park from the western end of the Cursus; the proposed new Coach Station building is this side of the two white coaches that show up in the middle of the picture. 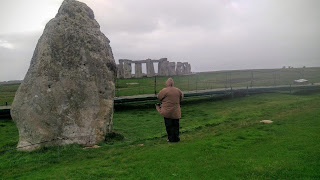 Summer 2016 Planned Improvement to Stonehenge - The removal of the fences! It is interesting to see the schedule of improvements that English Heritage included as part of the planning permission for the New Visitor Centre. This phase involves the release of the re-vegetated A344 area. Please refer to Figure 7 for details. The existing/temporary stock fence and gates to the north of the original A344 are to be removed and turf used to patch any resulting disturbances in the grass surface. 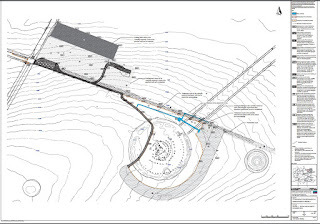 The areas of the permissible route that are formed using the ground reinforcement system are to be removed and patched using turf grown off site. The permissible route is now along the northern edge of the re-vegetated A344. The existing bridge over The Avenue and areas of reinforced grass to the west and east of the bridge are to be removed and patched using species rich chalk grass turf grown off site. The temporary barriers/fence, such as rope barriers, to the grassed A344 is removed. The existing stock fence to the north of the A344 and around the former car park and hub facilities is removed and grass is patched with turf as needed to make the grass surface good. The final configuration of the temporary barrier/fence, such as rope barrier, for visitor circulation is formed into its final functioning arrangement. 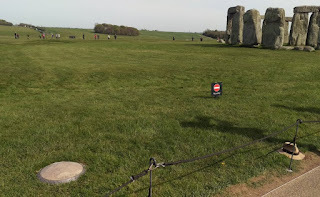 I suppose we will have to wait and see if the fences at Stonehenge are removed this summer, the practical difficulties it would cause the staff leads me to doubt it will ever happen, whatever the planning permission says. Permanent use of temporary coach park and modification of existing coach park to create 53 coach spaces and 26 motorhome spaces; construction of ancillary building for new coach visitor facilities; change of use from agricultural land and creation of new visitor transit system turnaround area for shuttle bus use; creation of extended visitor transit system turnaround area for shuttle bus use; decommissioning of existing visitor transit system turnaround area; all with associated ancillary and landscaping works. Suggested changes of particular relevance to tour operators and GTOs include the creation of a newly-designed coach park with a more streamlined layout and permanent spaces for up to 53 60-seater coaches; the introduction of a new Group Reception Building in a more convenient location, with exclusive WC facilities just for group visitors; and a new Visitor Transit Shuttle pick-up-point exclusively for groups to be located next to the Group Reception Building so groups can go directly from their coach to the Stone Circle at peak times. Kate Davies, English Heritage's manager of Stonehenge (email:kate.davies@english-heritage.org.uk) says: “The temporary expanded coach park which has provided extra parking for more than 20 coaches over the past year has made a substantial difference to the efficiency of our operation at Stonehenge, and brought benefits to all our visitors. It has also been welcomed by our travel and tourism colleagues bringing their tour groups to us. But permission for this temporary parking expires in 2017. So we are now seeking to introduce a sustainable longer term and permanent solution, which also addresses other pressure points on site that have impacted negatively on our ability to fully offer world class facilities at this leading UK attraction." 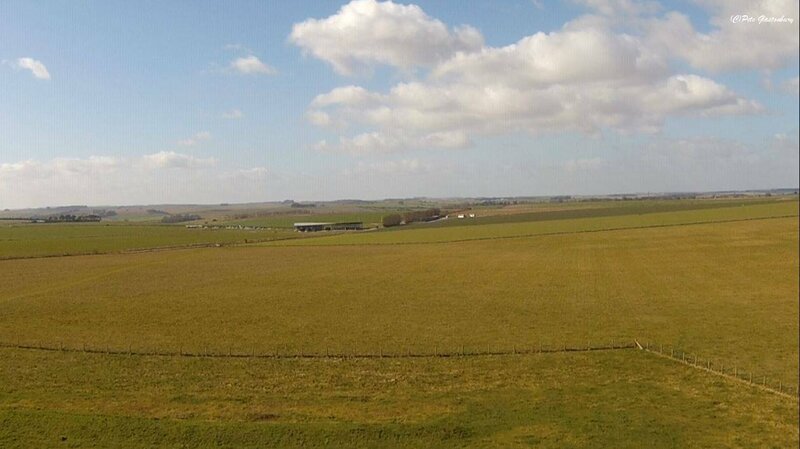 Sometime ago I asked a colleague at Stonehenge to stand where the middle of Stonehole 97 was excavated. I have roughly photoshopped a copy of the Heelstone on top of the image to give an indication of how it might have looked if there had been two stones, some think Stonehole 97 was the original position of the Heelstone and it was moved from there to its present position. Recently the UNESCO’s Astronomy and World Heritage Initiative, set out a "Summary of significant astronomical alignments in the Stonehenge WHP, with reference to the sites and components that might carry the OUV of the WHP in relation to astronomy." One of them is: "Stonehenge Station-Stone rectangle and the relevant sightlines and horizons: Most southerly moonrise/ most northerly moonset and Midsummer sunrise/ midwinter sunset". 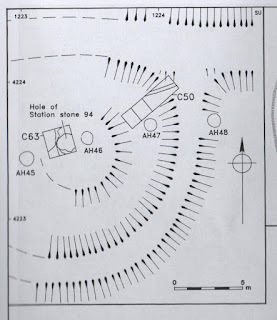 The four station stone positions are in a rectangle that on its longest edge just grazes the sarsen circle and seems to be aligned to astronomical features as above. Station stone 94 has recently been marked with a handsome polished sarsen stone in a stainless steel ring. From the public path the sight line to the fallen Station stone 91 should be very close to the sarsen circle. On a visit this week trying to align the marker left a large gap. My hat indicates a closer position which seemed to match the plan and photos. It would be nice if someone with more time and the right equipment could check if the marker position is correct or not. Antiquity have made available the full article on the cremated remains analysed from Stonehenge. Abstract: The assemblage of Neolithic cremated human remains from Stonehenge is the largest in Britain, and demonstrates that the monument was closely associated with the dead. New radiocarbon dates and Bayesian analysis indicate that cremated remains were deposited over a period of around five centuries from c. 3000–2500 BC. Earlier cremations were placed within or beside the Aubrey Holes that had held small bluestone standing stones during the first phase of the monument; later cremations were placed in the peripheral ditch, perhaps signifying the transition from a link between specific dead individuals and particular stones, to a more diffuse collectivity of increasingly long-dead ancestors. Christie Willis,Peter Marshall,Jacqueline McKinley,Mike Pitts,Joshua Pollard,Colin Richards,Julian Richards,Julian Thomas,Tony Waldron,Kate Welham and Mike Parker Pearson (2016). Threat to free access to Stonehenge? English Heritage Trust (EHT) has been awarded an £80M grant over an 8 year period by the government, on the premise that by 2021 it will be financially independent through visitors revenues, merchandising income etc. Under these conditions, it can be expected that Stonehenge and the Stonehenge visitor centre, managed by EHT, will come against considerable pressures to be as economically performing as possible (revenues and expenditures), not only for its own sake, but for the sake of English Heritage Trust and its many other, less visited "properties". Such pressure may result in lowering expenditure, such as specialized or expert personnel, maintenance, standards of archaeological curation, etc., and also in increasing revenues: by channelling in more visitors for shorter times, by increasing fees, and by slashing free or reduced cost access (this notably applies to neighbouring communities - likely to increase with Military families’ influx - to 'druids' during solstice and equinox days, and also educational groups, schools or universities). At the same time, there is a possibility that the local Wiltshire authorities may also seek to obtain some material benefits from the property, and that some arrangements will have to be reached on this with English Heritage Trust. 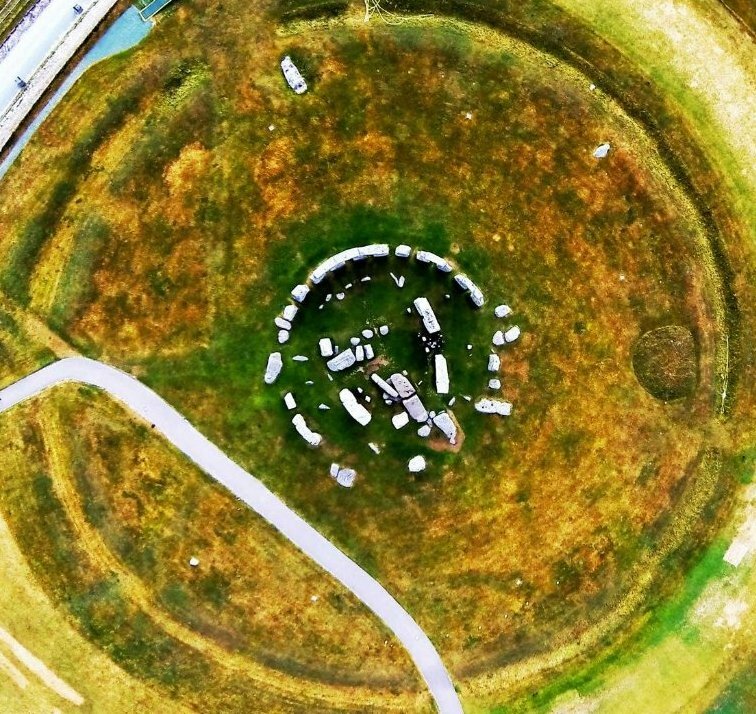 While this is a more general point that may impact on English Heritage properties over the coming decade, it is recommended to already enshrine now certain principles of access and public service in the Stonehenge management plan or documents by English Heritage Trust. In addition, it is recommended to explore what implications there might be to a possible insolvency of English Heritage Trust by 2021 – whether bailout mechanisms might exist, or whether properties might have to be rented out or even sold to other bodies, such as local authorities, and indeed whether such a fate might possibly apply to Stonehenge itself. 4 MISSION RECOMMENDATIONS The mission is hereby proposing a range of recommendations. These recommendations pertain to several levels, and also at a range of time scales: some can have short term implementation (e.g. establishing an expert role for future missions) while others have relevance on the longer term (e.g. ensuring institutional stability). In addition, of course, the recommendations proposed here do not bear on any specific dualling or tunnelling plans, which do not exist as yet. It is self-evident that more specific recommendations will have to be made by future missions, as the project advances and plans become more precise. 1. Establish a heritage-centred steering mechanism to ensure proper quality control at all stages of decision making, project design and implementation. This should include a scientific committee, a board of experts for monitoring and quality control at each phase to de defined. Set up a multidisciplinary team to work on a first DCO process including a monitoring and quality control process. Establish relevant sets of partnerships and MOUs between key institutions. Ensure a commitment to necessary human and financial resources. 2. Consider funding and calling upon the guidance of expert advisory joint UNESCO WHC and ICOMOS International technical mission(s) and giving them a role within the upstream process as referred to in the Terms of Reference of the Mission. These missions should be involved throughout all phases of the project and interact with key parties. They should provide guidance and international best practice and perspectives and quality control to DCMS and the project managers, including on compliance with obligations under the UNESCO World Heritage Convention. 3. Amend the generic DCO process map to show the significant heritage activities to be undertaken, including Heritage Impact Assessments (HIAs) for assessing impacts on OUV from proposed changes, in accordance with the ICOMOS Guidance on Heritage Impact Assessments (2011). 4. Produce an organogram of the key project parties and individuals involved in the project for effective communication to ensure the criticality of heritage being influential and effective from the outset. 5. Produce a Scoping Report following the ICOMOS Guidance on Heritage Impact Assessments (2011) that sets out the scope of work necessary for a HIA to be agreed upon with all relevant parties. This report produced at the commencement of the DCO process would also establish project mechanisms which would allow heritage and OUV to be built into the project design process. 6. Establish and incorporate into the project process from the outset current best practice in innovative technology available to the industry in Building Information Modelling (BIM), digital 3D virtual visualisations and virtual reality design with immersive technology in order to inform the iterative option identification and selection process. This would provide a more robust consideration of ‘what if’ scenarios and assessment of impact on OUV feeding back into the design process to achieve maximum protection and enhancement of the attributes of OUV. 7. Ensure the design is procured with the involvement of a landscape architect to adopt international best practice in landscape architecture to design mitigation measures as may be required for visual, noise and luminance factors appropriate to the protection and enhancement of the attributes of OUV. The landscape architect should be an active and influential member of the design team, having significant beneficial influence on the appearance of tunnel portal and approaches, route selection, signage and mitigation measures. 1. Align the HIAs with the DCO process being produced during option identification so as to appropriately influence the option identification stage. The HIAs should then be developed for option selection so as to influence refinement of the selected option and subsequent design. 2. Implement the State Party’s commitment to the ‘protection and transmission to future generations’ of OUV at Stonehenge and acknowledge that to do this requires longer term thinking than typical infrastructure design in non-World Heritage Sites. The whole asset life design of the scheme within the World Heritage Site should not be limited by 25 year traffic predictions but incorporate ‘asset resilience’ and ‘future proofing’ in design that do not negatively impact OUV to avoid future potential development / improvements that would negatively impact OUV and the surrounding Archaeological Priority Area (APA). 3. Undertake studies addressing potential changes in visitor numbers and behaviour that may occur by opening up the landscape with a tunnel scheme and ensure asset resilience appropriate to mitigate negative impacts on OUV and in the surrounding Archaeological Priority Area (APA). 4. Challenge the default adoption of Highways England design codes, specifications, norms and usual practice and seek departures where such requirements have a negative impact on OUV. 5. Review and implement international best practice for highway and tunnel design (e.g. signage, gantries, lighting, fire, safety and mitigation measures, etc.) where appropriate to achieve protection and enhancement of OUV. 6. Take account of International Charters related to heritage best practices and spatial planning (e.g. Historic urban landscape approach, Washington Charter, La Valette principals). 7. Develop temporary construction works scheme (e.g. construction facilities, traffic diversions, plant, storage, spoil removal, parking, access roads, fencing, drainage, etc.) in parallel and compatible with the permanent design and procurement so that impact on OUV is assessed for the whole life of the project. 8. Seek out and implement efficiencies in logistics and construction processes to minimise negative impacts on OUV within the World Heritage Site. The mission considers the following recommendations, in the area of archaeological heritage management, are important for the State Party to take on board and implement, in view of the wider-ranging and longer term issues raised by the project. 1. Ensure that relations between the responsible archaeological heritage management agencies and relevant actors are clarified and, as appropriate, formalised (periodic meetings, strategic planning, pooling of resources etc.) These include firstly the relations between Historic England (HE) and the National Trust (NT) (and their respective archaeological officers), and secondly interactions between these and the English Heritage Trust (EHT) and Wiltshire Council Archaeology (WCA) – each with their own remits and interests in the World Heritage site and the dualling/tunnelling project. 2. As part of this clarified collaboration between agencies and actors, ensure that interactions with the developer and funder of the project – Highways England – are carried out in a univocal and coordinated manner by the archaeological heritage parties, and conversely that funding or archaeological oversight and operations reaches all the actors concerned, including Wiltshire Council Archaeology. 3. Ensure particularly that the Historic England/National Trust (English Heritage Trust + Wiltshire Council Archaeology) archaeological heritage partnership, as it develops, exercises its legal, scientific and patrimonial commitments in the most vigorous and proactive ways possible. The wholehearted and decisive involvement of the archaeological partnership in these matters should be a sine qua non condition, including the ability to formulate requirements, veto proposals, orient others etc., in order to ensure that the heritage and archaeology dimensions of the project are clearly and consistently managed for the benefit of the OUV of the World Heritage site in particular, and of heritage and archaeology in general. This includes, among other things, questions of protocol of intervention (research design, sampling and excavations methodologies, recording, databases, archiving, etc.) and the choice of operator(s) to undertake these evaluations and excavations. This last point is crucial – it is strongly recommended that the choice, briefing and control of archaeological operators (i.e. contractors paid for by the developer) remains under the proactive control and close supervision of the archaeological partnership Historic England/National Trust (English Heritage Trust + Wiltshire Council Archaeology). 4. In view of the ongoing uncertainties surrounding the operations of both Historic England (HE) and English Heritage Trust (EHT) – both newly created in April 2015, with reduced budgets and strong pressures for self-sustainability – and in view of prevailing political and economic conditions, confirm the commitment of the State Party (the UK government, DCMS) to the protection and enhancement of archaeological heritage at the Stonehenge World Heritage site for the coming decades. More specifically, the State Party should formulate medium and long-term scenarios in case of further reductions in the funding and capacities of Historic England, and in its ability to exercise its statutory missions as an expert body. Likewise, it should enshrine certain principles of access and public service in the Stonehenge management plan, in the eventuality of an insolvency or restructuration of the English Heritage Trust (EHT) after 2021. 5. Review some elements of its communication strategy, and specifically handle with care and sensitivity any claims regarding the "£1.2 billion investment in heritage" that is represented by the Stonehenge part of the A303 expansion. This is not only objectively questionable since the investment is in the dualling/tunnelling infrastructure, but also likely to be misunderstood and raise (among stakeholders, professionals and the general public) questions as to "why is so much money being spent on heritage?” or on the contrary "why do no other sites or monuments benefit as well from this windfall?